This article was written By John Berra on 08 Jul 2012, and is filed under Reviews. 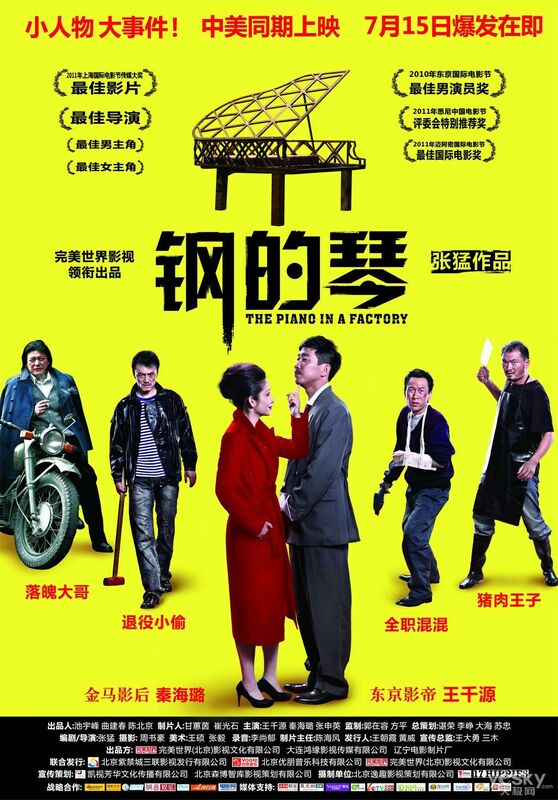 The Piano in a Factory takes place in the Northeast city of Anshan, China, in the early-1990s. With a local economy that was largely dependent on its steel factories, the city was undergoing redevelopment and industrial privatisation at the time, which left many citizens wondering how they would cope financially with modernisation being ushered in at such a tremendous pace. Zhang Meng’s comedy-drama focuses on one such local: accordion player Chen (Wang Qian-yuan) is vying with his ex-wife Xiao Ju (Jang Shin-yeong) for custody of their daughter, Xiao Yuan (Liu Xing-yu), who has shown talent as a pianist. The court leaves the decision to Xiao Yuan, with the young girl announcing that she will live with the parent who can provide her with a piano. In this respect, Chen’s ex-wife seems to have the upper-hand, as she has recently returned to Anshan with a wealthy new husband who makes his money from selling medical supplies. Reluctant to give up his daughter, Chen scrambles to raise the necessary funds, but none of his friends can afford to offer him a loan. An attempt to steal a piano from a local music school proves to be ill-conceived, but Chen refuses to give up and decides to build the instrument from scratch instead, using materials that can be scavenged from the abandoned factories. He puts together a team, including his frustrated but understanding girlfriend Shu Xian (Qin Hai-lu), and they find collective purpose in assisting with Chen’s last-ditch attempt to keep his daughter. Although this was an independent production, with actors reportedly contributing to the budget when funding threatened to run-out before principal photography was completed, The Piano in a Factory received a wide release in China and proved as popular with mainstream audiences as the studio-financed alternatives. This is perhaps because it favours a nostalgic but still-relevant local vision as opposed to the bland internationalisation of the glossy comedies and dramas that are usually set in Beijing or Shanghai. Many of the film’s incidental pleasures come from observation of community: characters eat barbequed meat, complain that their wives control their money, trade cigarettes, and attempt to pull petty scams at the mah-jong parlour. It also looks back fondly at a time when divorce was handled fairly reasonably, people rallied around their friends at times of need, and police officers kindly waited for suspects to finish their work before taking them into custody. There are lapses in pace in the final act (17 minutes were cut following the Toronto Film Festival premiere, which may explain why the resolution is reached rather suddenly following an otherwise leisurely narrative), but the spirited performances largely compensate for such flaws. Wang is a charming lead, capably balancing an optimistic outlook with increasing worry due to the likelihood that Xiao Yuan’s affections will be swayed by her mother’s gifts: Chen is trying to teach his daughter a value system, but even at a young age, she already seems to know that her father’s attitude to life is out-of-date. In-keeping with Chen’s profession as the leader of a band, the film is theatrical in style and staging; characters often enter from opposite sides of the frame and meet in the middle, delivering their lines against specifically-designed backdrops. There are satirical musical numbers which have a strong Russian influence due to regional characteristics, and all the locations blur into one because the wreckage caused by demolition has eradicated local landmarks, suggesting an easily-dressed stage. As it emphasises an urban regeneration project at mid-point, with old buildings in the process of being torn down to make way for new structures, The Piano in a Factory could almost be considered a ‘rubble film’. Yet the fascination that Western audiences may find with this space in transition is not reflected by the characters that walk around, across, and climb over the ensuing mess with a nonchalance that suggests such debris is just a part of everyday life. While the mise-en-scène certainly distinguishes the film from other family melodramas that have been produced in China in recent years, this is ultimately a story about the difficulties of parent-child relationships as a well-meaning father comes to terms with what he is unable to deliver in a rapidly developing economy. Chen is a classic salt-of-the-earth character: amiable, resourceful, and generally well-liked. But he gradually acknowledges that such positive attributes will not be sufficient to support his daughter. Heartfelt and warmly humorous, The Piano in a Factory is a charming commentary on the human consequences of change.